Laura Lippman's new novel alternates between the present and 1985. It starts with homemaker Eliza Benedict dealing with her two children in their suburban home in Maryland, near Washington DC. She has been following her husband Peter's career -- they have recently returned from England, and Eliza is still adjusting to being back in the USA. Her children, thirteen-year-old Iso and eight-year-old Albie, seem to be adjusting better than her, and Iso is doing very well on a soccer team. So the story looks like it will be about the domestic troubles of a soccer mom. Then Eliza gets a letter which brings back her past, from the man who abducted her for 39 days when she was 15. Walter Bowman was an attractive young man who still had difficulty getting dates, and the flashbacks from his point of view suggest he became a serial killer because he hadn't planned out his abductions well -- once he had taken the girls, he didn't know what else to do with them but kill them. He is a killer with very little sense of guilt, and although he comes from a poor family with little education, he is smart. He has also been educating himself in prison, while on Death Row. So the story becomes a mystery about what Walter wants and what Eliza will do in response. While we might expect her just to ignore his letter, she finds a reason to reply to him, and this makes us wonder what his hold on her could be at this stage, so long after the original crime. He has a plan to get her to help him avoid his impending execution, but what could it be, and how will she respond? Although the story is implausible in its details of Walter's scheming, it is not difficult to suspend disbelief. Once Walter's character is established the main interest in him lies in what he will do, and Lippman pays more attention to Eliza and her family. The strength of the book is in her confronting the past through her identity: she has changed her name and has not told her children about what happened to her. It turns out that her daughter Iso is starting to be more independent and rebellious than she expected, and she has to face her fears for her daughter about the danger of the world outside their home. Eliza is a complex person, so it takes much of the novel for the reader to come to understand her. We come to see the effect of her abduction not only on her, but also her psychiatrist parents and her sister, as well as her husband and children, all filtered through Eliza's character. Lippman's dialog and descriptions are compelling, making the book a great read. 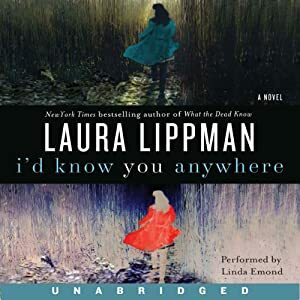 The performance of the unabridged audiobook by Linda Emond is perfect -- treading the difficult line between making Eliza sound like a victim and making her sound reckless and driven. Emond gives her a hint of vulnerability but also shows how she learned from her horrific experience, bringing out her confidence and readiness to see what Walter has to say. While the book does not focus on the most obvious fears she had during her abduction, it does explore her feelings about why Walter did not kill her while he did kill his other victims, and how she now relates to those other girls. In that, it is reminiscent of The Lovely Bones; it does not highlight the same kinds of feelings of tragedy and loss that Alice Sebold made so apparent, but it does show Eliza not just thinking about the other girls who Walter killed, but also dreaming about them and talking to them in her imagination. I'd Know You Anywhere is a subtle novel combining drama and psychological insights. Recommended.